Glass Rosewood Accented Jackson Clip Rectangle Trophy Award. 1/2" thick clip corner shaped jade glass in a rosewood piano finish base. Laser engraved to a white frost color, each award is individually boxed. Available in three different sizes. Glass Rosewood Accented Jackson Diamond Trophy Award. Diamond Prestige Glass with Rosewood Piano Finish Base. Give this award at your next employee awards recognition, achievement award or sales award event. Glass Rosewood Accented Jackson Rectangle Trophy Award. Jade Rectangle Prestige Glass with Rosewood Piano Finish Base. 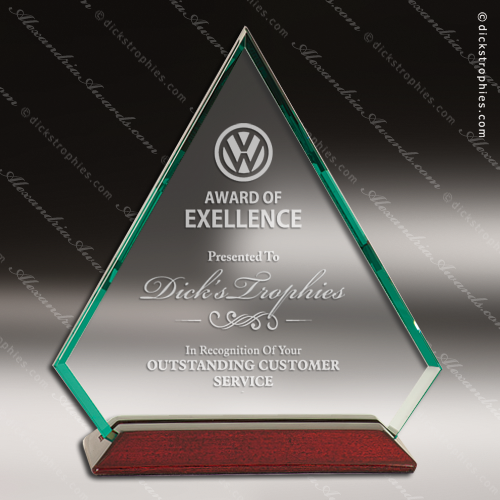 Give this award at your next employee awards recognition, achievement award or sales award event. Glass Black Accented Metro Jacqueline CircleTrophy Award. Clear Round Metro Glass with Black and Silver Base. Give this award at your next employee awards recognition, achievement award or sales award event. Glass Black Accented Metro Jacqueline Flame Trophy Award. Clear Flame Metro Glass with Black and Silver Base. 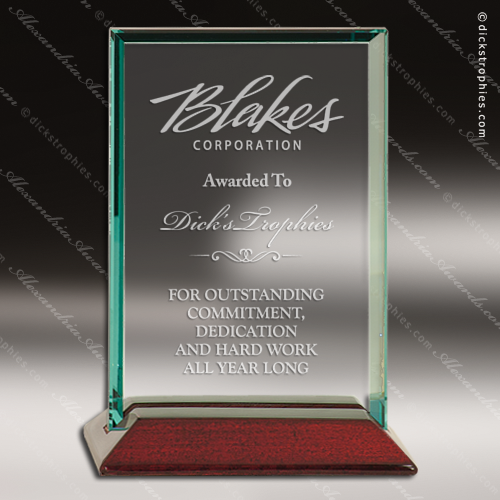 Give this award at your next employee awards recognition, achievement award or sales award event. Glass Gold Accented Jaycee Diamond Trophy Award. Beautifully cut bevels around the edges of this clear premier glass will frame your personalization while they catch the light for added sparkle. 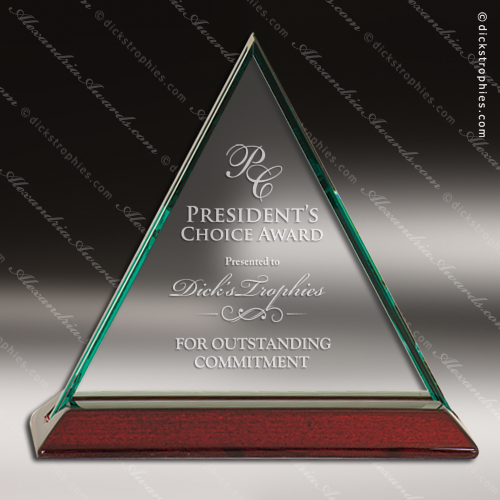 The glass is 1/2" thick, and mounted on a stunning gold base to create an award perfect for recognition of achievement.